Joseph Linus Edmondson was born September 23, 1929, to William and Emma (Weiss) Edmondson in Bethany, CT. Joe was raised near Bethany and attended school there. In February 1947, Joe enlisted in the United States Army and proudly served his country until July 1948. He served in Company B 703 Military Police at Fort Meyer, VA. This later became an infantry regiment and Joe served as second cook. He was honorably discharged with the rank of Corporal. Joe married Charlene Pike on March 26, 1949. 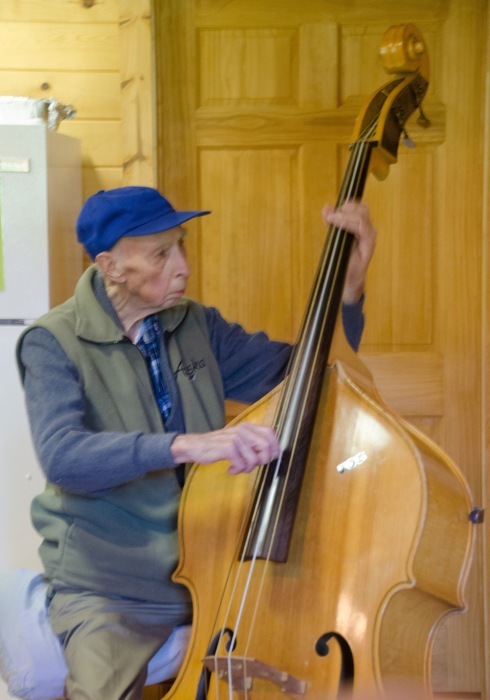 Joe loved music and for many years he played stand up bass in several bands. Joe worked in the heating trade for a number of years including: Naugatuck Fuel Co. and Buckley Brothers both in Connecticut. He and the family moved to Vermont and he worked for Dundon Plumbing and Heating from 1975-1976. On January 1, 1977, Joe started to work for the National Audubon Society where he remained for 15 years. He worked in Sharon, CT as maintenance and in 1984 was given the opportunity to head up the division called SWAT. He was a construction coordinator and in charge of all construction at all the Audubon facilities. He held licenses for heating, plumbing and electric. He also was a carpenter and mason. Joe retired from the Audubon Society in January of 1992. Joe and Charlene moved to Woodbine, Iowa in May 2005. Joe was a member of the United Methodist Church in Woodbine and The Noteables. Joe became a Master Mason in 1978. In 1984 he became Master of the Montgomery Lodge #13 in Lakeville, CT. He held duel membership in the George Washington Lodge #51 in Chelsea, VT as well. Joe’s love of music came from his parents who had their own weekly radio program. Joe died on Monday, August 27, 2018, at his home in Woodbine at the age of 88 years, 11 months and four days. Joe was preceded in death by his parents; daughter-in-law, Carol Edmondson; son-in-law, Charles Gratton; three brothers, John, William and Henry Edmondson; and four sisters, Margaret Phelan, Mary Clark, Catherine Steinmann and Anna Fleck. He is survived by his wife of 69 years, Charlene Edmondson of Woodbine, IA; three children Kenneth Edmondson of Rapid City, SD, Joyce Gratton of Fremont, NH, Maureen (Ed) Allen of Woodbine, IA; five grandchildren; three great grandchildren; and other relatives and friends.